Mesa Verde - In A Colorado Minute (Week 201) from Luci Westphal on Vimeo. 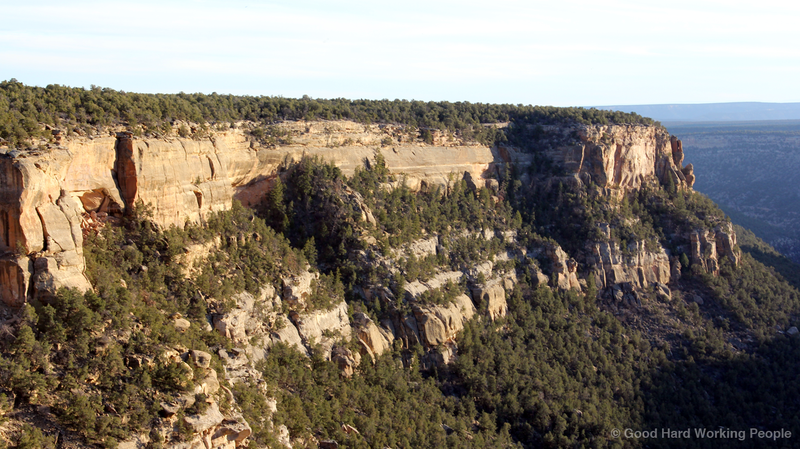 Mesa Verde is not only a beautiful US National Park but also a UNESCO World Heritage Site. It's the largest archeological preserve in the United States and features over 4000 archaeological sites and over 600 cliff dwellings of the Ancestral Pueblo peoples, also known as Anasazi. The Ancestral Pueblo peoples lived in Mesa Verde ("green table") from 600 to 1300, where they first built round pit houses, then mesa-top villages made of adobe and eventually the cliff dwellings. Mesa Verde is in the Four Corners region, where I had traveled to on my special "Week 200" road trip. By the time we made it from the Four Corners Monument to Mesa Verde, there were less than two hours of daylight left. As a result, I didn't actually get to go into any of the cliff dwellings and I didn't really have time to set up my tripod for shots. Therefore, this videos shows mostly exterior views (with a few pit houses at an open archeological site) and consists more of photos than actual video footage. I hope I can make a second visit happen later this year to explore more of the cliff dwellings. The featured song is the instrumental version of "Upcoming Downtime" by Josh Woodward, who made this song available on his website (http://joshwoodward.com) via a Creative Commons license. Thank you, Josh!